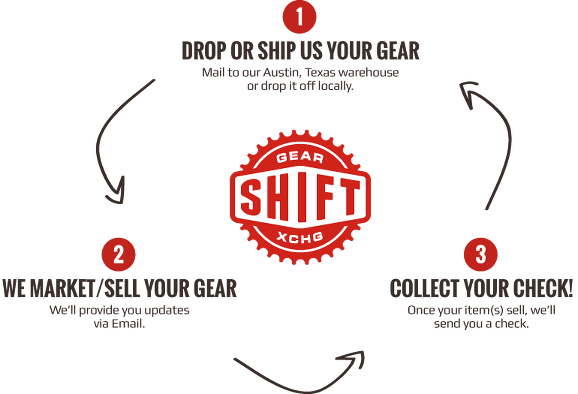 WHY CONSIGN MY CYCLING GEAR WITH SHIFT? We offer a fantastic alternative to Craigslist or eBay for selling your unwanted items. We become the middle man to eliminate the hassle factor for you – no more frustrations with the “buyer” who doesn’t show up, the “low baller” who isn’t willing to pay a reasonable price or the “scammer” who just wants to scam or otherwise take advantage of you. We will do extensive research to find pricing on comparable items so we can help you price your items for both quick sale and maximum take. We certify every item we offer. In the case of bikes, each items goes through a 12 point inspection (see detail description). This provides buyers with confidence that items are in great working order. We offer alternative methods of payment, including credit cards and Paypal. This expands your buyer base without you incurring merchant set up costs or fees. We expand your target buying audience by offering your item for sale via our eBay store, website and across multiple cities on Craigslist. 30% of the first $500 and then 15% of the remaining amount eBay and PayPal fees apply. Click here to read our full consignment agreement. Click the button below to submit your gear for review. This will open your email client. What are you selling? A bicycle, components, etc. Tell us about your item. Did you crash? Did you upgrade the components? We want to know! Clear photos of the item. If you are looking to consign your bicycle, please get clear photos of the drive side and any scuffs, scratches or damage. We can give you our best estimate when you send several clear photos.